The Palace Theatre boasts a fantastic central location along Shaftesbury Avenue, the main theatre stretch in the capital with a number of famous and historical theatre buildings dotted along its length. Given the vast numbers of people who swarm to the area every year to experience the best of London’s musicals and plays for themselves, the roads around Shaftesbury Avenue and the Palace Theatre are packed with bars, restaurants and hotels that cater to every tourist’s need. Additionally, the theatre is within walking distance of Piccadilly Circus and Leicester Square and their various attractions, and the shopping district of Covent Garden is a short walk away. By Tube: The nearest station is Leicester Square, which can be reached on the Piccadilly and Northern lines.By bus: Numbers 14, 19 and 38 all stop near the theatre on the Charing Cross Road.By taxi or car: The nearest car park is in Chinatown at 20 Newport Place. The tariff stands at £20.00 for 4 hours parking. There is a taxi rank outside Charing Cross Station for those wanting to travel back from the theatre via taxi. The Palace Theatre has a large main auditorium, seating 1400 people across four levels during each performance. Given the size of the theatre the quality of each seat is quite diverse, but the price for each ticket varies accordingly. The section nearest to the stage is known as the Stalls, and given the proximity to the stage the seats here are generally some of the most expensive in the house. The front and centre rows are the best places to try and get seats, as around the edges and towards the back of the Stalls the overhang from the upper tier can obscure elements of the performance. The Stalls are divided into two sections by a central aisle, along with a gentle rake. Pillars at the edge of Row S, H and C can cause obstructions to those behind them and reduce leg room for those next to them. The second tier of the theatre is known as the Dress Circle, and some of the seats here are arguably the best in the house. The front and centre rows of the section give a great view of the stage, and given some staging, many of the effects that go on above the stage can be best observed from here. The prices for each seat vary depending on how far back they are, and the seats to the side of the section are generally cheaper than those in the middle. The curve of the section can cause some problems, so it is worth sitting more centrally to avoid a sideways view of the stage. The Grand Circle is the third level of seating in the theatre, and ticket prices tend to drop sharply in this section. This is because you are quite far removed from the action, although again front and centre rows can still allow you to experience the show and are much cheaper, providing value for money. This makes the section potentially the best option for those looking for a bargain ticket without sacrificing too much in the way of stage views. Again the curve of the section restricts many seats, but those closest to the centre can be good value. The uppermost tier of the Palace is known as the Balcony, and feels quite tucked away from the main action. The section is very steep and very high up from the stage, meaning that it is not recommended for those who suffer from vertigo or have difficulty walking. On the positive side, seats here are invariably the cheapest on offer for each performance. Please be warned that many of these seats are restricted, and towards the back a lot of the stage is unable to be seen. 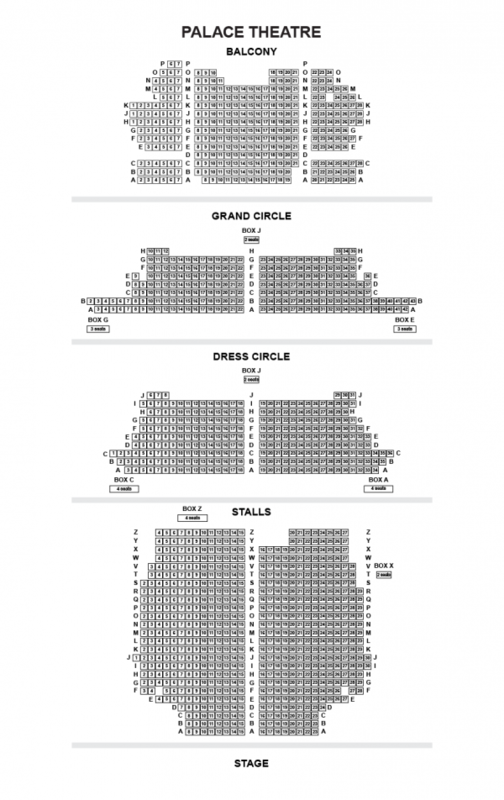 The Palace Theatre consists of 4 levels: the Stalls, Dress Circle, Grand Circle and Balcony. There are 2 steps from street level into the main foyer, although the alternative entrance on Shaftesbury Avenue gives level access to the auditorium. Once inside the main foyer there are 3 steps down to the Stalls, 30 steps up to the Dress Circle, 56 steps up to the Grand Circle and 77 steps up to the Balcony, which has very steep rows. Discounted rates are available to all disabled patrons and their carers. Wheelchair users should use the side entrance on Shaftesbury Avenue which has no steps to the auditorium. There is 1 space for a wheelchair or scooter user at W27 of the Stalls, or 2 spaces for smaller wheelchairs at W26 and 27. Transfer seating is available to any aisle seat in the Stalls, with storage space for a maximum of 4 wheelchairs and one scooter at the back of the Stalls. There is an adapted toilet by the accessible entrance, and there is no level access to the bars; however, drinks can be brought to disabled guests in their seats to compensate for this. The Palace Theatre has been a venue for top London entertainment since 1891, when it was opened by Richard D’Oyly Carte under the name of the Royal English Opera House. However it was rechristened the Palace Theatre of Varieties a short while later and instead became known for putting on some of the best revue shows and musical comedies of the period, including No, No, Nanette, Princess Charming, Cabaret, and The Gay Divorce, in which Fred Astaire gave his last performance on the London stage before moving to Hollywood in the effort to break America. In the latter part of the 20th century the Palace Theatre began to specialise in musicals, with some groundbreaking productions taking to the stage over the decades. The original productions of The Sound of Music and Jesus Christ Superstar opened at the theatre, with the latter running for an impressive 8 years. The theatre was also the home of Les Misérables when it transferred across from the Barbican Centre in 1985, staying at the venue for 19 years before moving to the Queen’s Theatre in 2004. After a 3 year run at the theatre Monty Python’s Spamalot closed in 2009 to make way for Priscilla, Queen of the Desert, which delighted theatregoers until December 2011. The theatre was then home to a revival of the classic musical Singin’ In The Rain before a musical version of Roddy Doyle's The Commitments opened in 2013.